ICE Scotland works to help inspire young people and get them interested in a career in civil engineering. We offer a range of educational activities for schools and resources for careers events. Find out more about the activities we provide and how you can get involved. ICE Scotland offer a range of educational activities for schools and resources for careers events. Provision of these intiatives varies across Scotland depending on the availability of volunteers. If you are a teacher interested in booking an activity please contact the ICE Scotland office. Find out more about some of the activities we run and support across Scotland. Whilst we do our best to accommodate all requests, activities are dependent upon volunteers being available. If you'd like more information or want to book an activity then please contact us. This classroom based activity introduces primary school pupils to the idea that civil engineers work in our communities to help prevent flooding. The pupils learn about land use and sustainable urban drainage using easily sourced materials. A fun activity which uses maths, science and teamwork skills to build a structure 4m high! 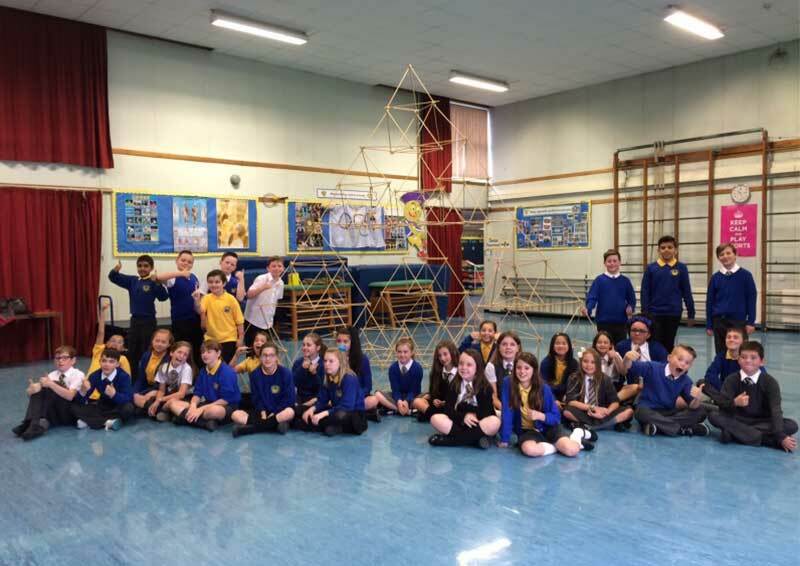 Using simple materials, a P6/7 class can learn about civil engineering and work together to construct a 4m high tetrahedron - far bigger than any one of them could manage by themselves. Bridges to Schools is a hands-on activity which gives P6/7 pupils the chance to build a 13m long cable stayed bridge. Having assembled the bridge they then walk across it, learning about bridges, teamwork and civil engineering as they go. The Bridge model is available for school clusters or groups of schools for a visit of 1 week. Schools can book hour long sessions for each group of 20 pupils. Getting the cluster secondary school involved can make this a great transition activity. The Rapid Response Engineering Challenge is an interdisciplinary, problem solving activity for S1/2 pupils, which challenges them to consider the engineering assistance required to restore basic life systems after a natural disaster. It is ideally suited to Curriculum for Excellence and links well with resilience education topics. Find out more from www.readyscotland.org. The Queensferry Crossing is Scotland’s biggest transport infrastructure project in a generation and will safeguard and improve a vital connection in the country's transport network. 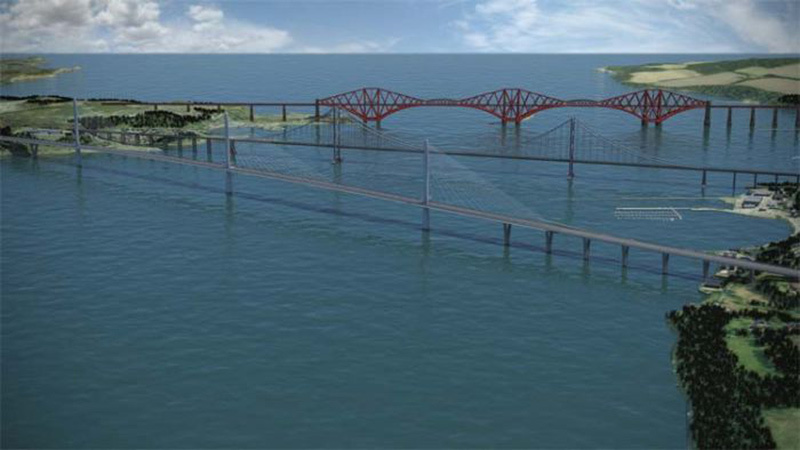 A new 1.7 mile (2.7km) bridge across the Firth of Forth is the most eye-catching element but the scheme also involves major improvements to the road network in the east of Scotland. It will change the way people travel between Edinburgh and Fife and beyond by increasing reliability, improving journey times, easing congestion and offering better connections. The project uses innovative methods and cutting-edge technology and materials to pioneer techniques in civil engineering and construction. ,li>An Intelligent Transport System (ITS) over 13.7 miles (22km) of 'managed motorway' will help regulate the flow of traffic approaching and crossing the Forth. A first for Scotland. The existing Forth Road Bridge will be maintained as a dedicated public transport corridor for buses, pedestrians and cyclists. By maximising the use of the existing road network, the FRC’s connecting roads will result in less impact on the environment, properties and communities. The scheme is on track for completion in 2016. To help promote civil engineering achievements close to you and across the UK, we're running a campaign called This is Civil Engineering. We're highlighting projects across the East Midlands that are helping to improve lives and improve our environment. Is the cost of a student loan preventing you from studying civil engineering? Why not apply for an ICE Scotland grant. You could get £4,000 a year for four years to study civil engineering at a college or university, full or part time from September/October 2016 onwards.